Tomorrow I'm going to get to do some gaming! Woo Hoo! I dug up an old heroclix mini that should work perfectly for my character, now off to base him for tomorrow's game! This should be available in print and PDF tomorrow! I've been looking forward to this one for a bit. I love The Mutant Epoch RPG, and a product like this will be very useful to me, I can see using it for Mutant Future or other P.A. RPG's as well. "Welcome to scenic Pitford: Gateway to the Ruins! This is your last stop before undertaking a dig in the nearby Great Ruins. Why not enjoy some of the fine services offered in this enclosed town? There are brothels, bars, massage parlors, shops, a casino and even a gladiatorial arena, all here for your delight. After all, this may be your last night in this twisted world, why not make it one to remember? Pitford is like a great immobile tank, stuck on the battle scarred, hostile plains in the shadow of the Great Ruins. This scrap metal enclosure is more than a home base for excavators; it is a dynamic adventure site, where opportunity, riches, espionage, crime, and debauchery await. 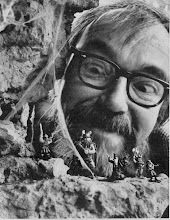 Herein, game sessions are as challenging and deadly as anything found outside of its junk and concrete shell. The fortress-town stands as a frontier bastion for a hard pressed humanity, providing a retreat from the harsh sand storms and flesh eating mutated beasts of the wilds. With one road leading in at the south and another at the north, it is stopping place for travelers, outlaws, savages, scavs, runaways and most of all, excavators. For over eighty years this fort has served as a base camp for dig teams who loot the boundless ruinscape beyond, where the lucky make it back alive with artifacts of enormous wealth and power. This book is both a game master reference resource, as well as a guide for players whose characters are visiting the bustling, old west style boom town. Included are 56 shops and businesses, 33 streets and alleys, access points to the topside roof, and stairwells to the notorious basement level. In addition, fortress defenses, gatehouses, and town watch details are included, along with a robust section on the municipal jail with encounters for those incarcerated within. 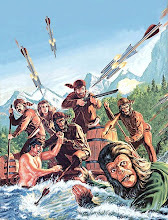 Also included are series of adventure hooks, appendices, map collections, the governing Association of Business Owners and the Freehold Scouts. 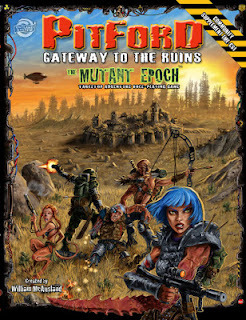 Situated in the north east corner of the Crossroads Region, Pitford figures heavily in upcoming adventures published for The Mutant Epoch role-playing game. While having this book isn’t necessary, it would enhance game play and provide details on resources adventurers need to recover, resupply, and recruit new excavators. ● 200 pages ● 108 illustrations ● 5 Maps ● 122 Locations ● Encounter Tables ● Random Rumors ● Adventure Hooks and much more! I'm really excited about this Kickstarter! I've been hoping for this one to come out for quite awhile now. The fact that it is directly compatible with Labyrinth Lord AND Mutant Future is just sooo freakin' cool! 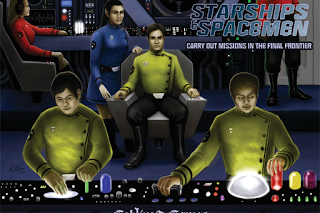 I can finally run my Kitchen Sink; Mutant Wizards in Spaace Campaign! If your at all interested please get on board and donate some $$ to make this happen!!! What's this? A post over on the Green Skeleton Gaming Guild Blog?? Shh...I'm sneaking back in from my hiatus. Bat said I wouldn't be able to stay away and he was right! 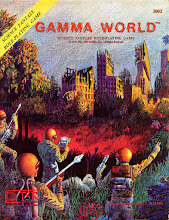 LOL.. Actually an old buddy of mine from out of town called me the other day, asking what Sci Fi RPG games were out that might meet his needs, he wants to get his gaming group to try something other than Magic and Battletech, he played Traveller back in the day and alot of D&D, he said wanted something like Traveller but with maybe some D&D mechanics, well of course that describes Stars Without Number to a tee. I think he is going to start up a Campaign soon, I'm excited to hear how it turns out. Anyways that caused me to dust off my notes and I found another Marvel Universe race that I figured I'd post for ya'll, yeah they are heavily based on Lizard Men but I figured what the heck. Reptoids are a race of savage reptilian humanoids. They average 6' in height when standing upright; have green scales with a yellow underside. They can walk erect or run on all fours and have powerful 6'long tails which they often use as weapons. The mindset of a Reptoid is very simple, "Bite it! Kill it! Eat it!" 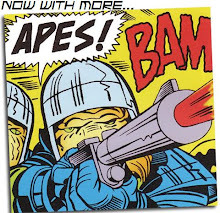 … Or if their prey looks like it might be a bit troublesome: "Slam it! Bite it! Kill it! Eat it!" SWN Default Campaign Setting Notes: Reptoids would be an ignored blip on the radar in the galactic scheme of things were it not for certain disreputable types finding that Reptoids (with the right motivation; FOOD!) make for vicious gladiatorial arena combatants and in some instances bodyguards. +4 on all Climbing related checks due to their climbing claws. PC Reptoids must have at least a 14 strength attribute. Attacks: Tail Slam; if the Reptoid forgoes any movement actions or other attacks in a round he can slam his opponent with a powerful tail attack for 1d8pts damage otherwise they will use a bite attack doing 1d6. Victims of a successful Reptoid tail slam attack must make an Evasion Save or be knocked prone by the creature's powerful tail. Reptoids are quite strong and get an additional +1 to damage on all physical attacks. *(I thought about having the tail attack do 1d10 damage instead of 1d8 but was concerned about power creep, feel free to up the damage or lower it depending on your campaigns needs). Reptoids cannot be psychics. In fact, Reptoids are particularly susceptible to Psychic influence and manipulation; they get a -2 penalty to any saving throws to resist telepathic attacks or scans. For this reason powerful Telepaths (like the alien Slavers in particular) often use them as bodyguards and such. Reptoids are a very primitive species and are not comfortable using advanced weapons or technology (to a Reptoid a crossbow is an advanced weapon). Some rare more intelligent specimens have been trained to use low tech weapons (swords, axes etc. ), but most prefer to use their natural attacks to get the job done. Adapted from Marvel Comics, no copyright infringement is intended. The Reptoids first appeared in Thor Annual #6.